WASHINGTON (CNN) -- President Obama is speaking about health care reform to a joint session of Congress on Wednesday night. Here is a transcript of the speech. 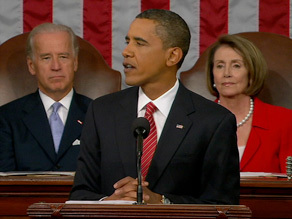 President Obama lays out health care reform specifics in a speech before Congress on Wednesday. Until -- until those -- until those businesses that seek capital and credit can thrive. Until all responsible homeowners can stay in their homes. That it our ultimate goal. But thanks to the bold and decisive action we've taken since January, I can stand here with confidence and say that we have pulled this economy back from the brink. Obama's health care speech a 'game changer'? And ever since, nearly every president and Congress, whether Democrat or Republican, has attempted to meet this challenge in some way. A bill for comprehensive health reform was first introduced by John Dingell Sr. in 1943. Sixty-five years later, his son continues to introduce that same bill at the beginning of each session. Our collective failure to meet this challenge year after year, decade after decade, has led us to the breaking point. Everyone understands the extraordinary hardships that are placed on the uninsured who live every day just one accident or illness away from bankruptcy. These are not primarily people on welfare. These are middle-class Americans. Some can't get insurance on the job. Others are self-employed and can't afford it since buying insurance on your own costs you three times as much as the coverage you get from your employer. More and more Americans worry that if you move, lose your job or change your job, you'll lose your health insurance, too. More and more Americans pay their premiums, only to discover that their insurance company has dropped their coverage when they get sick, or won't pay the full cost of care. It happens every day. Then there's the problem of rising costs. We spend 1½ times more per person on health care than any other country, but we aren't any healthier for it. This is one of the reasons that insurance premiums have gone up three times faster than wages. It's why so many employers, especially small businesses, are forcing their employers -- employees to pay more for insurance, or are dropping their coverage entirely. It's why so many aspiring entrepreneurs cannot afford to open a business in the first place, and why American businesses that compete internationally, like our automakers, are at a huge disadvantage. And it's why those of us with health insurance are also paying a hidden and growing tax for those without it, about $1,000 per year that pays for somebody else's emergency room and charitable care. And that is precisely what those of you in Congress have tried to do over the several -- past several months. During that time, we've seen Washington at its best and at its worst. We've seen many in this chamber work tirelessly for the better part of this year to offer thoughtful ideas about how to achieve reform. Of the five committees asked to develop bills, four have completed their work and the Senate Finance Committee announced today that it will move forward next week. Our overall efforts have been supported by an unprecedented coalition of doctors and nurses, hospitals, seniors' groups, and even drug companies -- many of whom opposed reform in the past. Now's the time to deliver on health care. The plan I'm announcing tonight would meet three basic goals. It will provide more security and stability to those who have health insurance. It will provide insurance for those who don't. And it will slow the growth of health care costs for our families, our businesses and our government. It's a plan that asks everyone to take responsibility for meeting this challenge -- not just government, not just insurance companies, but everybody, including employers and individuals. And it's a plan that incorporates ideas from senators and congressmen; from Democrats and Republicans, and yes, from some of my opponents in both the primary and general election. Let me -- let me repeat this: nothing in our plan requires you to change what you have. What this plan will do is make the insurance you have work better for you. Under this plan, it will be against the law for insurance companies to deny you coverage because of a pre-existing condition. Because there's no reason we shouldn't be catching diseases like breast cancer and colon cancer before they get worse. That makes sense. It saves money and it saves lives. That's what Americans who have health insurance can expect from this plan: more security and more stability. ... if you lose your job or you change your job, you'll be able to get coverage. If you strike out on your own and start a small business, you'll be able to get coverage. We'll do this by creating a new insurance exchange, a marketplace where individuals and small businesses will be able to shop for health insurance at competitive prices. Insurance companies will have an incentive to participate in this exchange because it lets them compete for millions of new customers. As one big group, these customers will have greater leverage to bargain with the insurance companies for better prices and quality coverage. This is how large companies and government employees get affordable insurance. It's how everyone in this Congress gets affordable insurance. And it's time to give every American the same opportunity that we give ourselves. Now, for those individuals and small businesses who still can't afford the lower-priced insurance available in the exchange, we'll provide tax credits, the size of which will be based on your need. This exchange will take effect in four years, which will give us time to do it right. In the meantime, for those Americans who can't get insurance today because they have pre-existing medical conditions, we will immediately offer low-cost coverage that will protect you against financial ruin if you become seriously ill. This was a good idea when Sen. John McCain proposed it in the campaign; it's a good idea now, and we should all embrace it. The problem is, such irresponsible behavior costs all the rest of us money. If there are affordable options and people still don't sign up for health insurance, it means we pay for these people's expensive emergency room visits. If some businesses don't provide workers health care, it forces the rest of us to pick up the tab when their workers get sick, and gives those businesses an unfair advantage over their competitors. And unless everybody does their part, many of the insurance reforms we seek, especially requiring insurance companies to cover pre-existing conditions, just can't be achieved. Likewise -- likewise, businesses will be required to either offer their workers health care, or chip in to help cover the cost of their workers. There will be a hardship waiver for those individuals who still can't afford coverage, and 95 percent of all small businesses, because of their size and narrow profit margin, would be exempt from these requirements. But we can't have large businesses and individuals who can afford coverage game the system by avoiding responsibility to themselves or their employees. ... I believe a broad consensus exists for the aspects of the plan I just outlined: consumer protections for those with insurance; an exchange that allows individuals and small businesses to purchase affordable coverage; and a requirement that people who can afford insurance get insurance. Still, given all the misinformation that's been spread over the past few months, I realize -- I realize that many Americans have grown nervous about reform. So tonight, I want to address some of the key controversies that are still out there. Some of people's concerns have grown out of bogus claims spread by those whose only agenda is to kill reform at any cost. The best example is the claim, made not just by radio and cable talk show hosts, but by prominent politicians, that we plan to set up panels of bureaucrats with the power to kill off senior citizens. Now, such a charge would be laughable if it weren't so cynical and irresponsible. It is a lie plain and simple. Now, my health care proposal has also been attacked by some who oppose reform as a "government takeover" of the entire health care system. Now, as proof, critics point to a provision in our plan that allows the uninsured and small businesses to choose a publicly sponsored insurance option, administered by the government, just like Medicaid or Medicare. My guiding principle is, and always has been, that consumers do better when there's choice and competition. That's how the market works. And without competition, the price of insurance goes up and quality goes down. And it makes it easier for insurance companies to treat their customers badly -- by cherry-picking the healthiest individuals and trying to drop the sickest; by overcharging small businesses who have no leverage; and by jacking up rates. Insurance executives don't do this because they're bad people. They do it because it's profitable. As one former insurance executive testified before Congress, insurance companies are not only encouraged to find reasons to drop the seriously ill, they are rewarded for it. All of this is in service of meeting what this former executive called "Wall Street's relentless profit expectations." And the insurance reforms that I've already mentioned would do just that, but an additional step we can take to keep insurance companies honest is by making a not-for-profit public option available in the insurance exchange. Now, let me -- let me be clear. Let me be clear, it would only be an option for those who don't have insurance. No one would be forced to choose it and it would not impact those of you who already have insurance. In fact, based on Congressional Budget Office estimates, we believe that less than 5 percent of Americans would sign up. Despite all this, the insurance companies and their allies don't like this idea. They argue that these private companies can't fairly compete with the government, and they'd be right if taxpayers were subsidizing this public insurance option, but they won't be. I've insisted that, like any private insurance company, the public insurance option would have to be self-sufficient and rely on the premiums its collects. It's -- it's worth noting that a strong majority of Americans still favor a public insurance option of the sort I've proposed tonight. But its impact shouldn't be exaggerated by the left or the right or the media. It is only one part of my plan, and shouldn't be used as a handy excuse for the usual Washington ideological battles. The public option -- the public option is only a means to that end, and we should remain open to other ideas that accomplish our ultimate goal. For example -- for example, some have suggested that the public option go into effect only in those markets where insurance companies are not providing affordable policies. Others have proposed a co-op or another nonprofit entity to administer the plan. These are all constructive ideas worth exploring. But I will not back down on the basic principle that, if Americans can't find affordable coverage, we will provide you with a choice. And -- and I will make sure that no government bureaucrat or insurance company bureaucrat gets between you and the care that you need. Finally, let me discuss an issue that is a great concern to me, to members of this chamber, and to the public, and that's how we pay for this plan. Now, Here's what you need to know. First, I will not sign a plan that adds one dime to our deficits, either now or in the future. I will not sign it if it adds one dime to the deficit now or in the future. Period. And to prove that I'm serious, there will be a provision in this plan that requires us to come forward with more spending cuts if the savings we promise don't materialize. Second, we've estimated that most of this plan can be paid for by finding savings within the existing health care system, a system that is currently full of waste and abuse. Right now, too much of the hard-earned savings and tax dollars we spend on health care don't make us any healthier. That's not my judgment. It's the judgment of medical professionals across this country. And this is also true when it comes to Medicare and Medicaid. In fact, I want to speak directly to seniors for a moment, because Medicare is another issue that's been subjected to demagoguery and distortion during the course of this debate. ... subsidies that do everything to pad their profits, but don't improve the care of seniors. Now, these steps will ensure that you -- America's seniors -- get the benefits you've been promised. They will ensure that Medicare is there for future generations. And we can use some of the savings to fill the gap in coverage that forces too many seniors to pay thousands of dollars a year out of their own pockets for prescription drugs. ... and just this year supported a budget that would essentially have turned Medicare into a privatized voucher program. So the commission can help encourage the adoption of these common-sense best practices by doctors and medical professionals throughout the system -- everything from reducing hospital infection rates to encouraging better coordination between teams of doctors. Now -- there you go. ... I know that the Bush administration considered authorizing demonstration projects in individual states to test these ideas. I think it's a good idea, and I'm directing my secretary of health and human services to move forward on this initiative today. Now, add it all up and the plan I'm proposing will cost around $900 billion over 10 years, less than we have spent on the Iraq and Afghanistan wars and less than the tax cuts for the wealthiest few Americans that Congress passed at the beginning of the previous administration. Now, most of these costs will be paid for with money already being spent -- but spent badly -- in the existing health care system. The plan will not add to our deficit. The middle class will realize greater security, not higher taxes. And if we are able to slow the growth of health care costs by just one-tenth of 1 percent each year -- one-tenth of 1 percent -- it will actually reduce the deficit by $4 trillion over the long term. But know this: I will not waste time with those who have made the calculation that it's better politics to kill this plan than to improve it. That is why we cannot fail. Because there are too many Americans counting on us to succeed -- the ones who suffer silently and the ones who shared their stories with us at town halls, in e-mails, and in letters. And he expressed confidence that this would be the year that health care reform -- "that great unfinished business of our society," he called it -- would finally pass. He repeated the truth that health care is decisive for our future prosperity, but he also reminded me that "it concerns more than material things." "What we face," he wrote, "is above all a moral issue; at stake are not just the details of policy but fundamental principles of social justice and the character of our country." One of the unique and wonderful things about America has always been our self-reliance, our rugged individualism, our fierce defense of freedom, and our healthy skepticism of government. And figuring out the appropriate size and role of government has always been a source of rigorous and, yes, sometimes angry debate. That's our history. For some of Ted Kennedy's critics, his brand of liberalism represented an affront to American liberty. In their minds, his passion for universal health care was nothing more than a passion for big government. But those of us who knew Teddy and worked with him here -- people of both parties -- know that what drove him was something more. His friend Orrin Hatch, he knows that. They worked together to provide children with health insurance. His friend John McCain knows that. They worked together on a patients' bill of rights. His friend Chuck Grassley knows that. They worked together to provide health care to children with disabilities. On issues like these, Ted Kennedy's passion was born not of some rigid ideology, but of his own experience -- the experience of having two children stricken with cancer. He never forgot the sheer terror and helplessness that any parent feels when a child is badly sick. And he was able to imagine what it must be like for those without insurance, what it'd be like to have to say to a wife or a child or an aging parent, "There is something that could make you better, but I just can't afford it." That large-heartedness, that concern and regard for the plight of others is not a partisan feeling. It's not a Republican or a Democratic feeling. It, too, is part of the American character. Our ability to stand in other people's shoes. A recognition that we are all in this together, that when fortune turns against one of us, others are there to lend a helping hand. A belief that in this country, hard work and responsibility should be rewarded by some measure of security and fair play. And an acknowledgement that sometimes government has to step in to help deliver on that promise. And they knew that when any government measure, no matter how carefully crafted or beneficial, is subject to scorn; when any efforts to help people in need are attacked as un-American; when facts and reason are thrown overboard and only timidity passes for wisdom, and we can no longer even engage in a civil conversation with each other over the things that truly matter -- that at that point we don't merely lose our capacity to solve big challenges. We lose something essential about ourselves. That's not what we came here to do. We did not come to fear the future. We came here to shape it. I still believe we can act even when it's hard. ... I still believe that we can act when it's hard. I still believe we can replace acrimony with civility and gridlock with progress. I still believe we can do great things and that here and now we will meet history's test, because that's who we are. That is our calling. That is our character.